For those of you preparing to teach your child how to read, ideally it should be in the child’s native/dominant language. Listening to other Latina moms who are homeschooling, they say that teaching their children to read in Spanish first was easier anyway, because there are less rules/exceptions to remember. And once you have successfully taught a child to read in one language, teaching him or her to read in the second is much easier. I have slowly been discovering more and more programs and resources out there for teaching your child to read in Spanish (and English). And I'm excited about sharing them all with you! Here's the first. Enjoy! 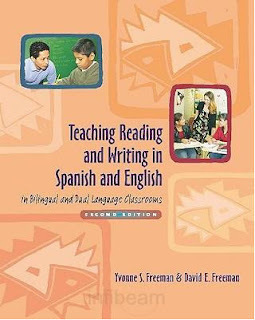 This second edition of the Freemans' classic text updates their ideas and strategies in response to new research and changing contexts for teaching reading and writing in both English and Spanish. Between the growing number of Spanish-speaking students in dual language and bilingual classrooms and the increasing focus on accountability, teachers need a resource that gives them research-based instructional advice for helping all students meet standards while giving nonnative speakers access to the same high-quality education as their English-speaking peers. 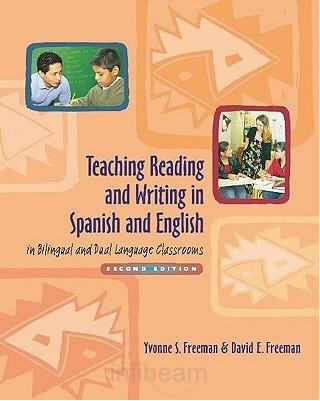 They must have the most effective methods for teaching reading and writing to students in two languages, and Teaching Reading and Writing in Spanish and English in Bilingual and Dual Language Classrooms provides what teachers need. • writing instructional strategies that match students' developmental levels. With updated references and new ways for educators to connect sound instruction to state standards, the Freemans provide teachers and administrators with the theory, research, and practical information they need to meet new challenges and help every student reach high levels of reading and writing proficiency. This book is also available in Spanish. You can find new and used copies in La Librería. Be sure and check out our other resources for bilingual teachers. Weekend Links: Countries to Toy Story! Is Homeschooling the Right Choice for My Familia?